I’m not sure exactly where to begin so I am just gonna’ jump in and swim around for a while. I’ll probably be flailing so you may want to grab a towel. I really can’t believe it’s been more than a month since I last posted something here but there it is staring me in the face , June 1st. A number of people have written asking about me and wondering what is going on, if I am all right and that sort of thing and I really appreciate the concern. The truth is that I am actually doing fairly well even though I do find myself struggling in some areas. As a result I am having a hard time getting motivated to do any of the “extra” stuff. This blog is but one of the casualties. I have been MIA from Facebook, Flickr and Twitter as well and as I begin to write this there are still more than 200 emails I should reply to. Yes, even in China life sometimes gets in the way. I have been busy finishing up three separate assignments and after months of what I sometimes felt was the nitpicking to end all nitpicking we were able to put all three to bed over the past two days. More on that in a future post. I still need to finish the re-design of this blog and get it launched. It is actually pretty much ready to go but I need to give Ryan over at Dao By Design some feedback and have him apply the finishing touches. As simple as that sounds I somehow have managed to not get it done (sorry Ryan). That reminds me, I’ll be giving out the new blog address here soon and then we’ll have an official launch in the next month or so. If that weren’t enough, my friend Nik Tjhin has been patiently trying to get me to finish an interview so it can be included in the September launch of his new travel magazine. Nik’s Unearthing Asia website is a great “Travel Zine” focusing on culture, lifestyle and attractions all around Asia and he is making a foray into print now as well. Check out the website but be prepared to spend some time there. Nik and Ryan, before Monday morning. Really. No really I can do it this time. I guess the biggest difficulty for me of late has been the inability to take any photographs or more accurately the inability for me to take any photos I like. Suddenly it feels too much like work. Seriously, I haven’t liked a single shot I’ve taken in months. Maybe it has something to do with shooting on assignment and not taking (or making) the time to shoot what I want to shoot. Now don’t misconstrue anything. I consider myself fortunate and I’m happy to be working and I am learning a lot in the process. I am struggling nonetheless. Perhaps another reason for the lack of motivation is some preoccupation with my health. While somewhat stabilized things always seem to be in a sate of flux. This whole getting old(er) thing really does stink as it truly is always something. Since I last wrote I have dealt with another bout of kidney stones. I really can’t recommend having kidney stones in Liuzhou. Not one of the yahoos fine medical professionals I’ve encountered here seem to have the mathematical ability to figure out the correct narcotic dosage for a 200 (give or take) pound man. I am thinking that probably merits its own future entry. I recently walked around Liuzhou for two days thinking Michael Jordan had died of a heart attack. One of my students, after chasing me down over two city blocks in the sweltering mid-day heat excitedly told me the shocking news. I remember thinking, “Man, if it can happen to Jordan then what chance do I have?” It was only by chance that I saw the local rag a couple of days later and realized her mistake. 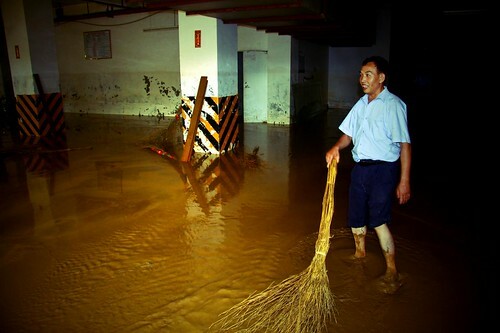 For those who have asked, the typhoons have not had much of an impact here in Liuzhou but we did have our own flood to deal with last month. Flooding is fairly routine here and the locals somehow “deal” with the annual fallout. Still, this year saw the worst flooding in years. Remarkably the entire mess was cleaned up in just a couple of days… almost all of it done by hand. 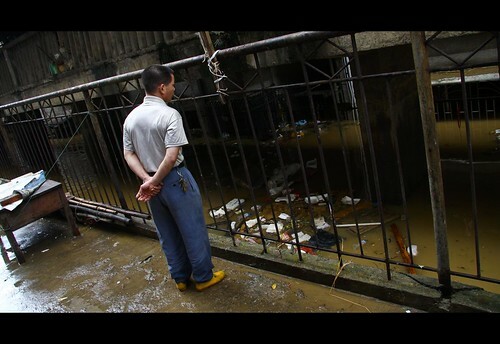 Here a Liuzhou retailer begins the arduous task of removing ankle deep mud from the garage under his shop. You can see the high-water mark along the back wall and on the pillars. Mr. Zhao (below) is a Liuzhou factory worker and has lived in the same ground-floor riverfront apartment for a little more than 10 years. The building will soon be demolished to make way for a mega shopping-housing complex that begins in the city center and extends more than three city blocks to the riverfront. He was lamenting that the demolition hadn’t come sooner, along with his relocation settlement. As he looked down at his flooded apartment he was mostly concerned about the television and air conditioner, explaining that his furniture was rubbish even before the flood! Only later did I understand that he was out of town when the flood waters began to rise, else he would have at least removed the TV. He said this was the fifth time water had entered the building since he moved in but this year was the first time the apartment flooded past the ceiling. The place where he is standing was covered when the flood peaked three hours earlier. Neighbors had already begun cleaning up. Oh, I spent a week teaching 15 middle school students English. I sold out and did it for the money. I mean I figured how bad could it be, right? Yes I am an idiot. It was designed as a summer English camp and I taught the brats angels in my house from 9:30 until 5:30 for 6 days straight. I had so many brilliant ideas on the morning of day one but it all eroded into blissful (for the kids) chaos by the end of day two. I mean I totally lost control. Truly a case of the inmates running the asylum. I never saw it coming. My neighbors hate me. I’m fairly certain some of the kids hate me. My dog was hating me but I think she is coming around. Never again. To any of you middle school teachers out there… RESPECT! My daughter Natalie is traipsing around Europe for a month. She has already been to London, Paris, Florence and Cinque Terre. She is traveling with three other girls and I think they are making their way to Switzerland today. The girls all go to The University of Denver and they are studying abroad in France this next semester and decided to “do” Europe before classes begin. You can read about Natalie’s exploits on her blog here. If you head over there leave her a note, I’m sure she’ll be excited to hear from you. Oh and my youngest, Nick, has decided (for a variety of reasons) that he wants to try and graduate from High School a year early so he can go to college a year early and eventually begin to work a year earlier. Yeah I know. Now I have no doubt as to whether or not he can do it but I am still not totally convinced it is the right thing to do. Whatever the eventual outcome, it won’t be easy. His targets included Northwestern, Columbia, Penn and Berkeley. Please pray for scholarships. Or you could just send money. The boy turns 17 TODAY! If I owe you email, look for it over the weekend. I truly hope you’ll find it! ~ by Expatriate Games on August 14, 2009. Thanks Craig, I’ve got a lot of catching up to do! Good to see you updating again! Hope all the “issues” will be resolved soon! Me too my friend, talk to you soon. Also glad to hear its ok. Sounds like your teaching experience was similar to a lot of expat yanks. Not sure about the “teaching experience” compared to others but it was definitely NOT like anything I’ve experienced teaching here the past two years! Nice to see ya! Don’t worry about returning my email, ’tis unimportant. Middle School? Are you insane!? Never, ever, teach middle school kids. That’s an entire level of Hell. (I may alter Dante’s structure of Hell to better fit FTs in China). Stay frosty, it’s good to see ya back! Sounds like you have been pretty busy. I’ll keep my eyes open for more news from you. Glad you’re back… and to know you’re alright. Looking forward to more. The best to you on the health front (I can, unfortunately, empathize), and on the family front. Nice to see you back on the web EG. Pic’s, as always, are superb. Say no more. The root of all problems, mentioned and not, is spending six straight days with middle-school children. One is too many. One in the vicinity can intensify kidney stones. More distance from them will cure all ills. Hang in there. Micheal, will we hear from you one of these days? This up-date is from August, too long ago. Anyway you can let us know how you are doing? Miss your updates on Flickr and here. Hey P, everything is getting back to normal I think so I should be around more often. I need to get caught up with you too. Are you in the states for the holidays? LOL, you are a little behind. We moved 3.5 months ago and don’t plan on leaving again. Looking forward to see you around.